I setup a Windows Server 2008 for VPN access using Remote Routing Access Service. 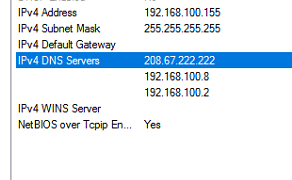 When a user would connect to the VPN the DNS servers would be reversed. For example, I had two local DNS servers and an external (OpenDNS) DNS server. However, the adapter would always assign the external DNS server first and then the internal DNS servers as secondary. The VPN client couldn’t locate local resources on the network over the VPN. In my troubleshooting this issue, I found that this is actually a bug. Here is what I did to fix the issue. Step Two: Make a Dword32 Key and Name it SuppressDNSNameServers. Give the value of the key 1. Step Three: Restart the RRAS service on the server. You should be set! If the above doesn’t work, try rebooting your server and trying your VPN client again. Thanks for reading! Please consider subscribing to my blog. This was posted by techspeeder. This entry was posted in Troubleshooting and tagged RRAS, Server 2008, VPN, Windows 10 on April 6, 2017 by Merlin Halteman. At the time of searching the DNS it may showing some error like error code 0xc000000f by that, it is showing the irrelevant type of searching.